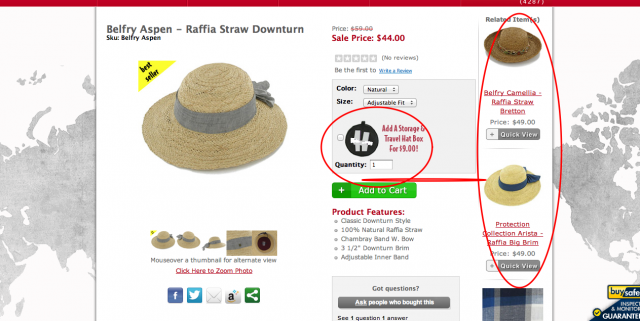 Online merchandising is one aspect of eCommerce that must not be overlooked. A great-looking online store can only get you so far, to really generate online sales you must proactively guide customers to the products they want. There are several well-known eCommerce merchandising tactics like cross-selling, up-selling, advanced site search, faceted navigation, and customer segmentation, each could be an entire blog post of it’s own but cross-selling tops the list for ways to impact the bottom line. Are You Upselling or Cross-Selling? One pretty significant statistic from a Predictive Intent report is that cross-sells can actually increase conversion by 3% when shown on the checkout page. That makes the art of cross-selling a logical place to begin when evaluating merchandising opportunities. So first things first, what is a cross-sell? In eCommerce, a cross-sell is the action of presenting users with additional products they can easily add to their order during the checkout. This interaction is very important because it helps to drive up the sites average order value, meaning more dollars in the pockets of etailers. This differs from an upsell because with that type of sales tactic, you are presenting the shopper with alternate options to replace the product they are viewing. This is also useful in increasing the average order value because it’s goal is to make it enticing for a shopper to swap out the product they are viewing for a more expensive option. The first, and most important step is evaluating product relationships and deciding what really makes sense to cross-sell along with which products to offer. Depending on the size of your product catalog, this could get incredibly complicated and time consuming. On one side of the spectrum, you could manually create product relationships by using built-in features. Magento Enterprise for instance, provides upsell and cross-sell functionality out of the box, so that you can relate products through an easy-to-use interface. Some good rules of thumb are to choose cross-sells that actually go with the product, are at a smaller price tag as the product, and require no configuration. The idea is to make it a no brainer for customers to add the item, without distracting them from the purchase they are making. For example, a great cross-sell for a digital camera would be a memory card or camera case, not a laptop computer. On the other end, for etailers with a ton of SKUs and configurable products, a third party might make sense. We like tools like Predictive Intent’s Personal Merchant because they allow eCommerce store owners to set rules and logic, then sit back as the site learns which relationships are most successful. Personal Merchant can actually learn your customer's expected behavior and begin presenting products in the order that converts best. Even though increasing online revenue is the goal of any etailer, many hesitate to employ cross or upselling on their site because they dont want to be viewed as that stereotypical used car salesman. I would argue that you are not forcing a customer to buy something they do not want, you are simply offering them complementary products. For example, is it wrong for a store to put the contact cases next to the contact solution? Is it wrong when an apparel sales person tells you they have a great belt that matches the shirt you are buying? When cross-selling is done correctly, users will appreciate the suggestions and not be turned off by them. When I added this Canon digital camera to my cart, a light box appeared with a ton of options I could add on to my order. In theory this is great, I have a selection of products I might need that will fit the camera. However, this could also cause major distractions, what if I decide I want to go back and look at the rest of the cases? 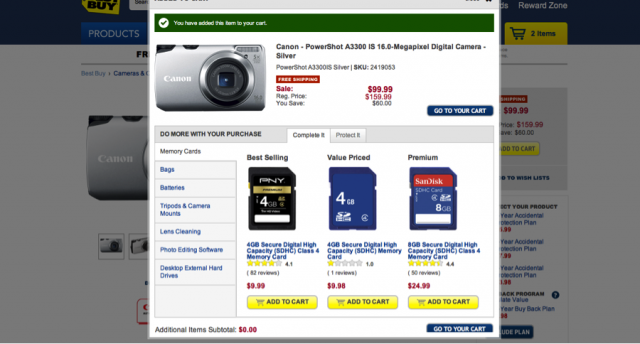 What if I am price shopping and want to see if another comparable camera has cheaper memory cards? Best Buy might be losing people by showing them way too much information, you can see there are 6 product categories on the left navigation and 2 tabs in the top navigation of the light box – that’s a lot of opportunities to let a potential conversion navigate away from the checkout button. Hats in the Belfry is an example of an etailer who has grasped both up and cross-selling to guide their customers to higher priced shopping carts. You can see in the screenshot below, they offer the option to add a hat box to the order. This is an inexpensive, easy-to-add item that goes well with the product they are purchasing. This is a win-win for the etailer as well as the customer because both parties are meeting their needs: the customer gets to ensure that their product will be stored safely so it lasts longer and the etailer adds a quick and easy $9.00 to the order. Hats in the Belfry also offers related products that are at a slightly higher cost than the product the customer is viewing. This is a great upsell because these items are similar in style and function, but might be of higher quality. This customer might find value in swapping because they can get higher quality for only a few bucks more. Again, the goal with any merchandising effort is to increase the likelihood of conversion and/or to increase the value of that conversion. By offering the right products at the right time, online merchants can achieve both. Does your eCommerce strategy include an effective cross-selling technique? Contact us to learn how we can help!